What’s up my brunchin’ people! I just had the chance to try out The Brixton SF and I was really impressed! They’ve got a great and extensive brunch menu with something for everyone no matter what your tastes are. I’m excited to show you four of my favorites from The Brixton SF’s brunch menu so hopefully you can find something you like! Front and center in the image below is my absolute favorite, the Fried Chicken Benedict. It’s made up of a house-made English muffin, cornmeal crusted chicken thigh, poached cage free egg, shredded cabbage, picked peppers, and bacon hollandaise. What I love most about this is the texture and unique flavor the fried chicken adds to the traditional Benedict. It’s super filling, and totally worth a try! 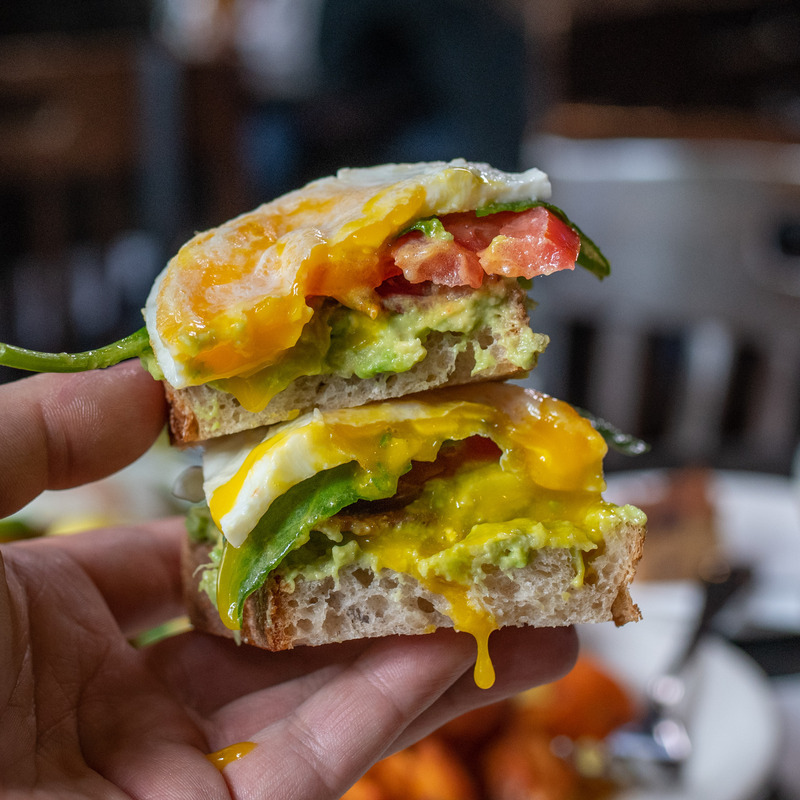 Next up from The Brixton SF, you definitely need to order the Avocado toast. It’s a delicious stack of Avocado, tomatoes, spinach, and two eggs, all on some toasted bread. It can get a little messy with the runny yolk, but I wouldn’t want it any other way. Your first bite sets up the rest of the experience by breaking the yolk and letting it cover everything else. 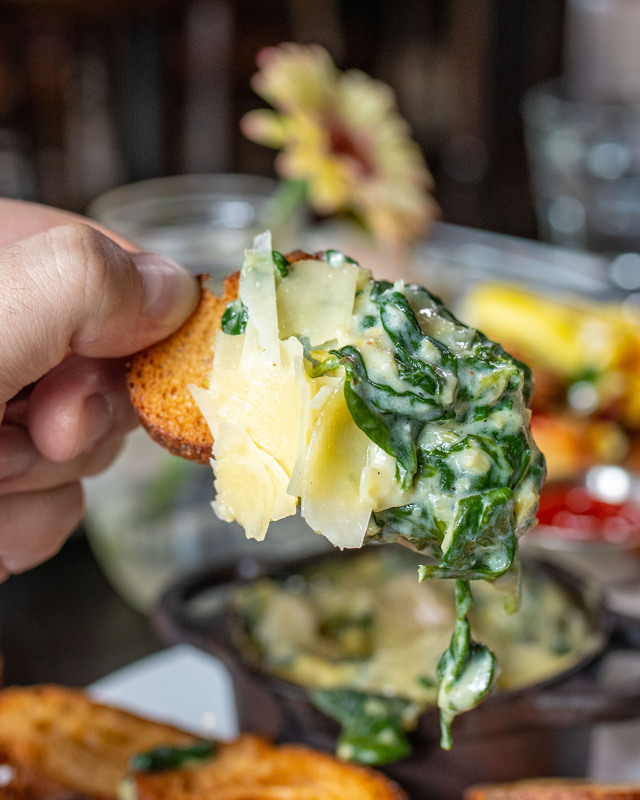 It’s technically a starter, but if you order this for yourself, you’ll definitely leave happy. The French Dip is another solid choice from The Brixton SF. It’s made up of sliced prime rib, Swiss cheese, and horseradish aioli on a Panorama French roll with hot au jus on the side to dip the sandwich in. 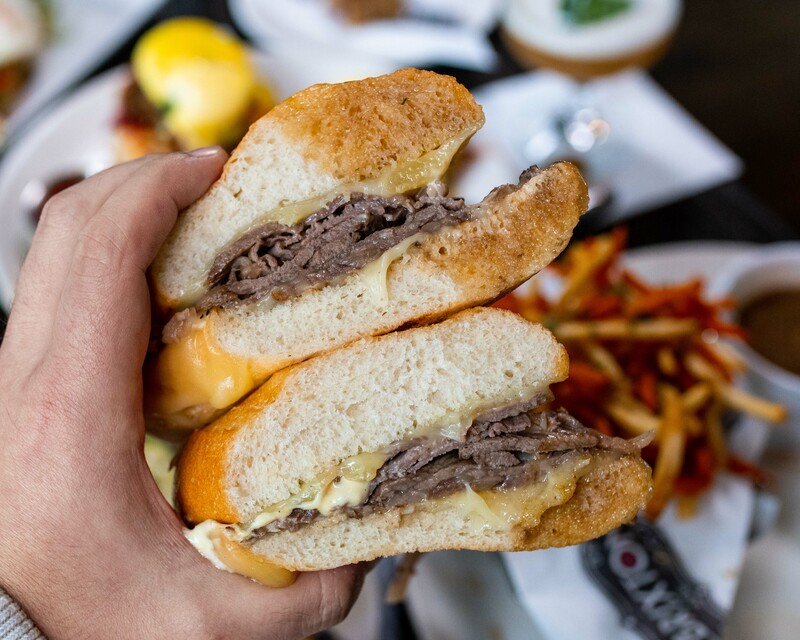 The melted cheese with the prime rib are amazing on their own, but when you let the french roll soak up some of the au jus, it adds a whole layer of salty, savory flavor on top of everything else. And the mix of regular and sweet potato fries are crispy, tasty, and perfectly seasoned. 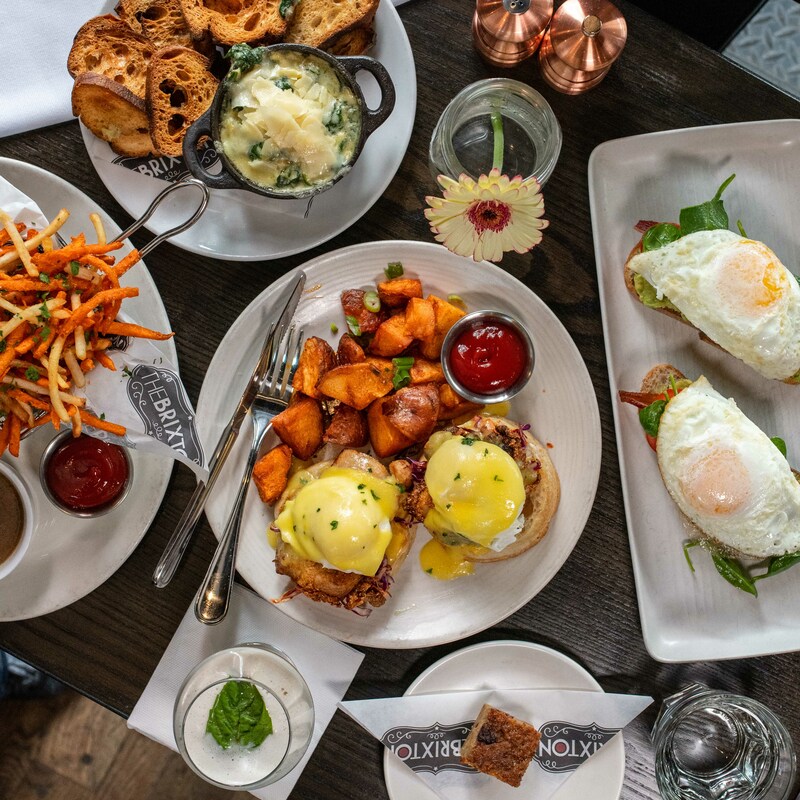 The Brixton SF is definitely a spot you need to add to your brunch rotation. They’ve got a lot of space to work with, but it’s a popular spot and it fills up quickly on the weekends, so be sure to get there early or make a reservation. The outdoor seating on a bright, sunny day in Cow Hollow is definitely the best experience, so try to grab one of those tables if you can. Till next time, Nomsters! To see more San Francisco Bay Area recommendations, check out our Bay Area tab!